Biased or unbiased? It’s one of the great debates of the 3D world, right up there with “Is computer art real art?” and “Are DAZ Studio users real 3D artists?” There are many people who swear by biased render engines, and just as many who swear by unbiased render engines. Now, I don’t want to get into that debate for real in this post. (Of course, if you want to do so in the comments, fine. I’m always up for a good debate.) What I’ll do is attempt to explain what each type of render engine is, what it does, and show some strengths and weaknesses of each in a direct comparison of a basic scene. Bias, when applied to 3D rendering, is defined as systematic error. This refers to the way light is handled. A biased renderer will introduce a certain amount of error, a bit of blur, into the way it calculates the light values. This results in dramatically faster render times than most unbiased render engines offer, and gives a somewhat less than perfectly real look most of the time. An unbiased renderer calculates the light without introducing any systematic error, resulting in a very realistic handling of light. Unbiased renders can take days to complete, or “clear”. But the resulting image can often be confused for a real-world photograph. Okay, there’s your simple explanation of the terms. Maybe even a hair on the over-simplified side, but overly technical terminology makes my eyes cross. DAZ Studio uses the 3Delight render engine, which is biased. It is also capable of using unbiased render engines such as LuxRender and Octane via plug-ins, which makes it the perfect place to compare biased vs. unbiased renders. I use LuxRender via the Luxus plug-in. So, here we go. I’ve set up a basic scene, just a room with a few objects in it. Now let’s render out the baseline. This render was produced with 3Delight, with default materials on all objects, using one Age of Armour Advanced Ambient light and one DAZ linear point light in the candle flame. My overall response to this render? Yuck. Biased or unbiased doesn’t matter one little bit when the end result just plain stinks. Oh well, that’s precisely why 3D content providers make shader sets, so you don’t have to stick with the default texture an item comes with if it’s less than satisfactory. A bit of experimenting revealed that the intense hot spot came from the ambient light, so it will just have to stay there and get taken out with Photoshop, because if I take away the light… well, you know what happens when you render a scene without light. Nothing. Nada. Blackness. In the interests of increasing render speed, I set the Sampler to “sppm.” But look what happened! The dreaded “fireflies,” those annoying bright spots, appeared almost immediately. Argh. So I stopped the render before it really cleared and switched to “metropolis,” which is my preferred Sampler anyway. The problem with metropolis, though, is it can take a long time to clear. While Lux does its thing in the background, I’ll take a moment to look at the most obvious difference between the two renders: the ambient light. 3Delight likes ambient lights, which distribute light evenly over the entire scene, regardless of walls and doors and such. In the case of the AoA Advanced lights, you can adjust the falloff so the light blends into shadow around the edges, which is a really cool and useful feature. I didn’t do that here, though, because I just wanted even lighting overall. Now, LuxRender does not like ambient lights, because they’re just plain not physically correct. The closest it comes to an ambient light is a “sun” light. This acts just like a real sun in that it won’t pass through walls. So in this scene, the sun light is falling at an angle through the window, producing real-life light and shadow effects. The candle flame is also a light source. I converted it into a meshlight. You can’t really tell here, though, because I only let the render run until the fireflies popped up. The next glaringly obvious difference is in the wineglass and its contents. This particular product, Wine Me, was designed with both Studio and Luxus materials. The only difference between the two renders is that on the Lux one I switched the Luxus parameters to “on” for both glass and wine, which made a huge difference and shows a hint of why some people go nuts over unbiased renderers. Okay, on to the better, firefly-free render. Now I’m going to throw some numbers at you. Render time: 47 min, 20 threads, 88.08 S/p, 628% Efficiency. Yes, that’s right, this not-quite-cleared test render ran for 47 minutes. I set it to use 20 processor threads (Lux can handle up to 32) so I could keep messing around with my computer with no problems while the render ran. Lux took 88.08 samples per pixel, which is nowhere near what most final renders need, but serves for a test. Most final renders clear around 500-1000 S/p. Sometimes you get lucky and it’ll clear at 200, sometimes it’s worth running to 2000 (that’s the kind of render that can run for a week or so…). 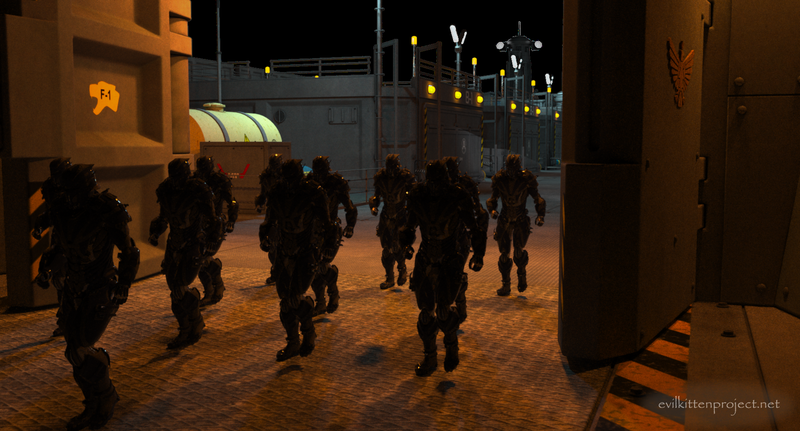 The 628% Efficiency means the renderer had plenty of light to “see” the scene and render it out. A low Efficiency gives terrible results, most of the time. All right, so on to the overall effect of this render: still not all that great. 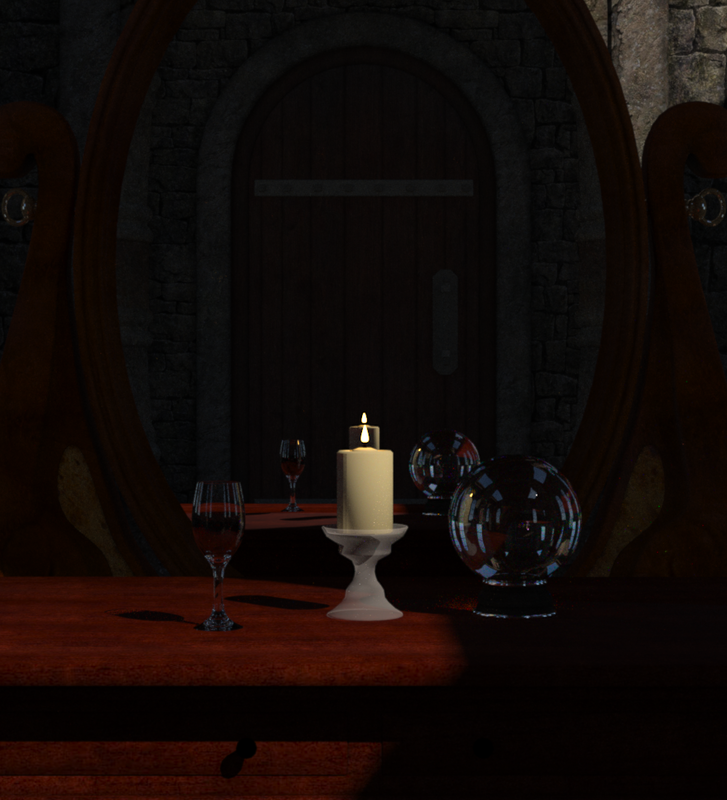 I like the more natural lighting, and the wineglass is awesome, especially the way it catches the candlelight and has the beginnings of a caustic effect showing on the table, but some of the materials just plain stink. If you look at the candle holder, you’ll see that Lux didn’t quite know what to do with it, and it doesn’t cast a shadow. And that crystal ball is just plain dull. Some of that is due to the low S/p, but more of it is because the Luxus autoconverter didn’t do the greatest job switching out DAZ materials for Lux-friendly materials. Moving on now. This time I’m going to tweak the materials and the lighting and do my best to make each render shine, so you can see a more true comparison between the two. Oh, that dratted hotspot! It just won’t go away. 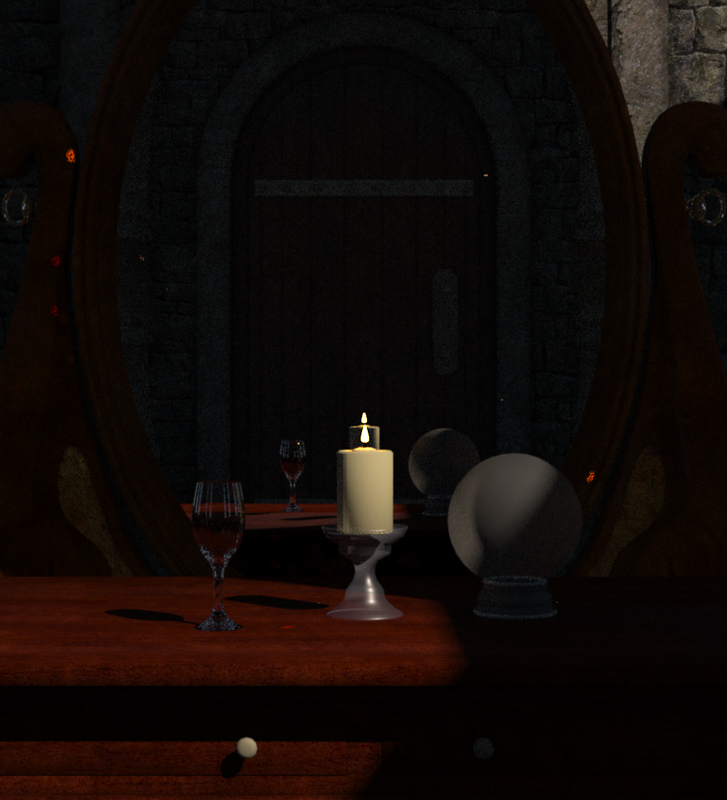 But in this render, I’ve changed the materials of all the glass items, and also the Index of Refraction for the wine, and gave the little knobs on the mirror a more metallic texture. This is a pretty decent example of what a biased renderer can do with ambient lighting. I’d like to see some shadows coming off the objects, but that would require additional lighting, which would throw off the comparison with the unbiased image. Here you go. Other than the candle holder, which still has Lux scratching its head and wondering what to do with it despite its new parameters, this shows some of the power of unbiased rendering. I allowed it to run for an hour and twenty-three minutes, at which point a few fireflies popped up and I shut it down. It reached 166.71 S/p at 494% Efficiency. 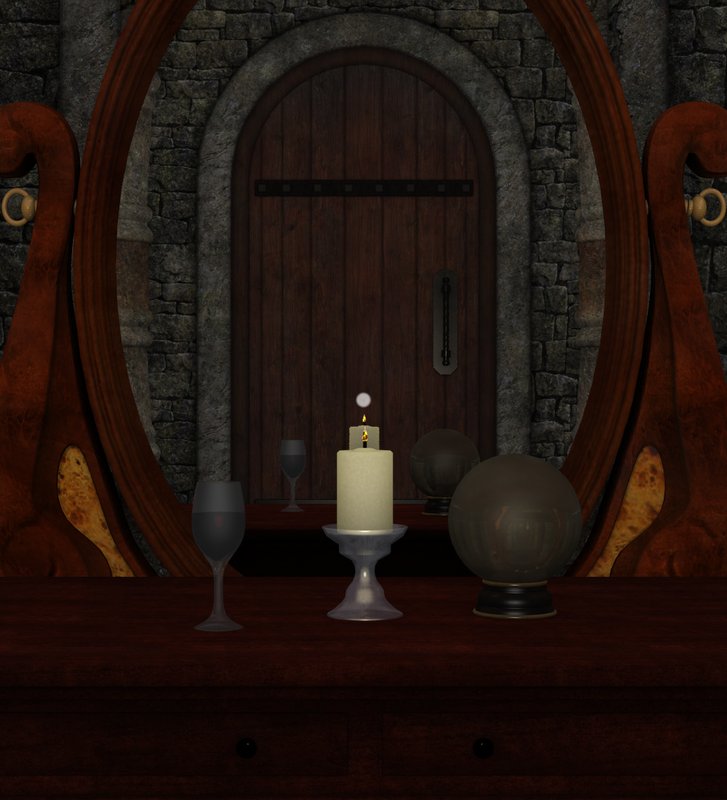 If you look at the crystal ball, you can see the reflections of all the windows in the room and the blue sky outside. 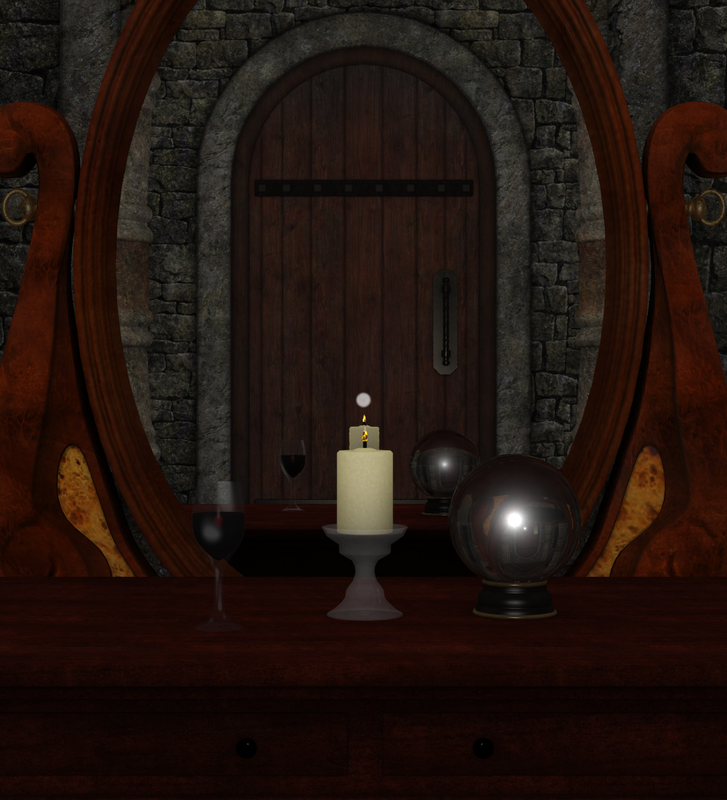 There are caustic effects from the wineglass and the crystal ball starting to show up on the table. And the wine shows some reflections and variations in color, a result of the light bouncing around inside of the liquid. So there’s my illustration of the basic difference between biased and unbiased render engines, the way they handle light. When I first got into 3D art, I was all about unbiased rendering, because you’ve got to admit, it does an amazing job with light. The way Lux handles glass and metals in particular just makes me drool. But now, there are a boatload of new toys specifically made for rendering in 3Delight, such as the AoA Advanced lights and subsurface shaders. Using the new lighting and materials means that, in my opinion, the biased renderer can hold its own against unbiased rendering any day. At least, it can in certain situations. End result? I’ve come to rely heavily on both render engines. Sometimes I’ll even composite images from both of them at once. Biased is better for some situations, unbiased wins hands down when it comes to lighting effects. That’s it for now. In the future, I intend to get into more of the fun stuff, such as subsurface scattering and volumetrics, and show how the biased vs. unbiased debate continues. And at the end of this post, I’m throwing in an example of a composite render, using both Lux and 3Delight. 29 Jun	This entry was published on June 29, 2014 at 3:19 pm. It’s filed under Learning New Stuff and tagged 3D render engines, DAZ Studio, LuxRender. Bookmark the permalink. Follow any comments here with the RSS feed for this post.